Kipling is a brand I’ve always being familiar with, My Grandma and Mum have quite the collection of Kipling bags! So when Kipling contacted me to take part in their #SheWearsKipling campaign I jumped at the chance to get involved. #SheWearsKipling is all about all the different ways to style up their new collection. They kindly sent me Alenya Shoulder Bag and seen as these bags are so practical, stylish and great for everyday use. 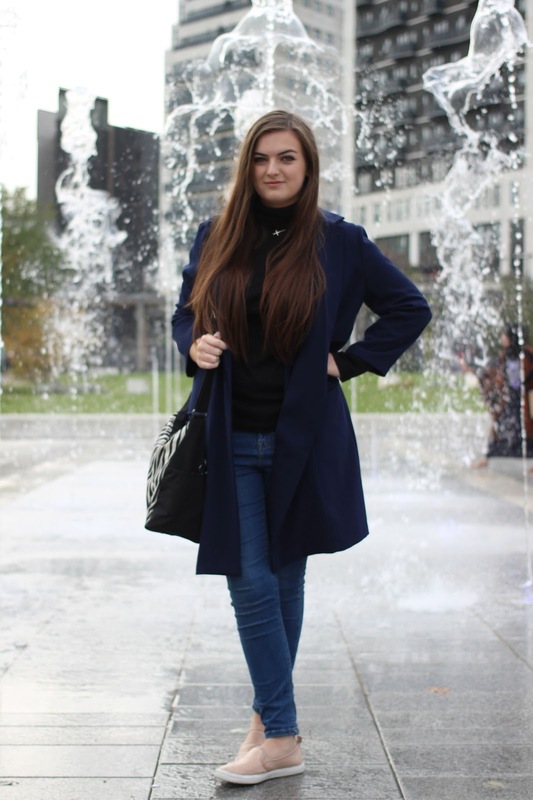 I thought I would style it up quite casually and what I would wear to lectures. The fact that the bag is so lightweight and spacious means it’s great to have all my uni work in there and still be stylish with the print.If you’ve being reading my blog for a while, you’ll know that I’m a big fan of animal print so this style is perfect for me. What do you think of the bag? Do you like Kipling? Don’t forget that I’m running a giveaway to win tickets to Birmingham’s Festive Gift Fair here. That navy blue jacket is so chic! Great look! You look so pretty. I like your shoes. I think that bag is divine! Gorgeous! Looks like a great bag for school, or for carrying baby things. Your bag is really cute, love how it compliments your blue coat. Great look! Lovely post, love the bag! I'm obsessed with Kipling – I own 1 handbag, 2 shoulder bags, 1 weekend bag, 3 purses and 1 laptop case. Looking into getting a smaller shoulder bag and an iPad case. They're such an amazing bag company. It looks so good. Love the whole outfit.